GoPro stock has fallen, just as the bears predicted all along, but not for the reasons they proposed. Many stocks have had a rough ride over the past month or so, but few can match the astounding fall of GoPro (NASDAQ:GPRO) stock. Shares of the action camera maker lost half of their value between August 10 and September 11, reaching their lowest point since the week GoPro went public in mid-2014. GoPro Stock Performance, data by YCharts. Considering the scale of this stock crash, you might assume that GoPro has disclosed some very bad information in the past month. However, that's not the case. GoPro's stock drop has come even though the company hasn't announced any major news since it reported a big earnings beat and better-than-expected guidance in late July. Less than one year ago (when GoPro stock was trading for more than $80), Citron Research published a report predicting that the stock would crash to $30 within a year -- and would have trouble maintaining that valuation. A recent article by Benzinga noted that the stock has almost reached that $30 level, and concluded that "Citron's GoPro short thesis is playing out." A closer look at the evidence casts doubt on this assertion. To be sure, GoPro stock has fallen dramatically from the rather generous valuation it held in late 2014. But it hasn't been for the reasons cited by Citron. Citron Research's main argument is that GoPro is a hardware business, and hardware businesses cannot maintain high profit margins in the long run. Citron also contends that GoPro is already reaching the end of its growth opportunity, projecting that it will only generate $2.1 billion of revenue in 2017. That would be a shocking slowdown, considering that analysts currently expect GoPro's revenue to reach $1.93 billion this year, up from $1.39 billion a year earlier. Citron's first claim is broadly true: Tech hardware businesses are almost always commoditized sooner or later. However, the example of Apple (NASDAQ:AAPL) shows that a tech hardware company with a strong brand -- a description that aptly fits GoPro -- can maintain a high profit margin for a very long time. Apple Operating Margin and Gross Margin, data by YCharts. As the chart above shows, Apple's margins peaked in early 2012 and seemed to be in a steep downtrend by the end of that year. 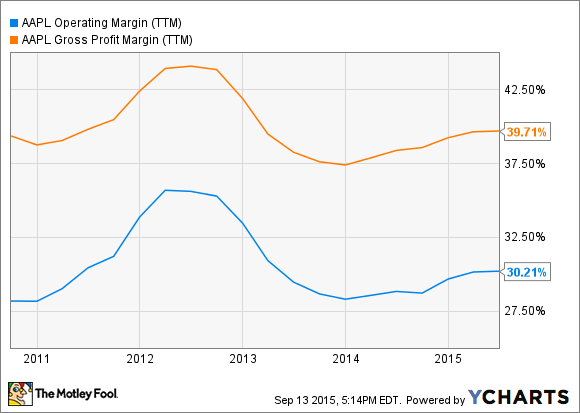 Yet Apple's gross margin and operating margin have both stabilized around their (very strong) levels of five years ago. GoPro has a very short history as a public company, but its gross margin and operating margin have both risen significantly compared to where they were at the time of its IPO. 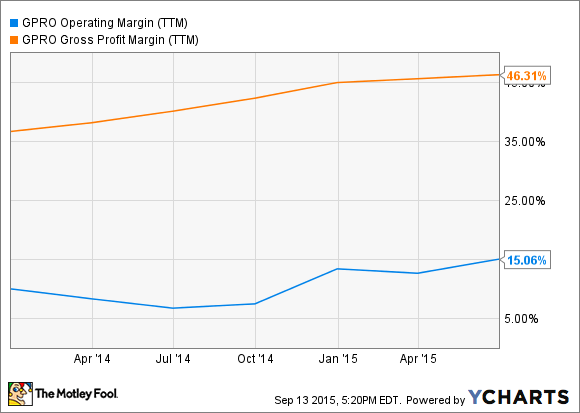 In fact, gross margin has been above GoPro's "target model" of 42%-44% for the whole past year. GoPro Operating Margin and Gross Margin, data by YCharts. In short, GoPro's markets may eventually become commoditized, sinking the company's profit margin. But there's no evidence that this will happen anytime soon -- and GoPro could make a lot of money between now and whenever commoditization sinks in. As for revenue expectations, only time can decisively refute Citron's bearish view. However, it's worth noting that analysts currently expect GoPro to hit $1.93 billion in revenue in 2015 even without launching a new flagship camera this year. GoPro isn't expected to update its flagship HERO4 Black camera this year. Image source: GoPro. Furthermore, GoPro is developing a quadcopter drone that is expected to go on sale in the first half of 2016, opening a new growth market for the company. GoPro CEO Nick Woodman has described it as the "ultimate accessory for your GoPro". As a result, I think there's a good chance that GoPro will release its next-generation flagship camera around the same time that the drone goes on sale. This would drive a sharp uptick in revenue growth at that time. Citron Research pegged GoPro's sky-high valuation last fall to its overhyped aspirations to become a media company. Its report made some good points to put GoPro's social media following in context. Yet it took a rather simplistic view of GoPro's potential opportunity here. In July, GoPro announced its first major media monetization initiative. It has created a premium content licensing portal: essentially an app store for advertisers to license GoPro user-created content for commercial purposes. This is likely to be a much more lucrative media strategy than relying on a YouTube revenue-sharing payout. GoPro may not have stunning success in every market it competes in. However, with the company's stock price having plummeted in spite of rising earnings estimates, GoPro shares are now quite cheap for a growth company, providing plenty of margin for error. 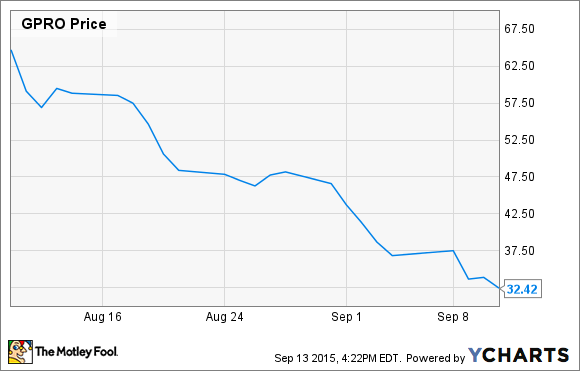 Citron Research was right that GoPro's stock was primed for a big drop last fall. But based on the company's strong fundamentals, GoPro stock is likely to go right back up in the coming years -- just as Apple stock has done in the two years following its own bizarre collapse.